The last update and FAQ I posted was in October last year, 5 months ago, time flies!!! Today I would like to share more details on the changes I was talking about in October. Last year it has been a bit difficult to keep up with my daily job, the blog, social and email interactions and then the brushes 🙂 So… I decided to take a temporary break from the company I work for in Geneva, for six months starting January, just to see how things would go. There are several Fude [brush] related projects that I would love to achieve this year and this break will allow me to concentrate on them. I have six months to fully devote on the brushes (exciting!! ), every single day I wake up eager to “work”! This is my passion, my dream and I am putting all my love and energy, litteraly everything I can into it! I thought I would miss my job as an IT architect but I have to admit that nothing compares to the thrill of “creating” and seeing the brush designs come to life! The very first thing I do every day, as I wake up, is to thank the universe for having given me this opportunity, I am just so incredibly grateful and whatever happens, this feeling of gratitude will forever fill my heart. Since October last year we launched the new PRO collection, the Face and the Eye set. 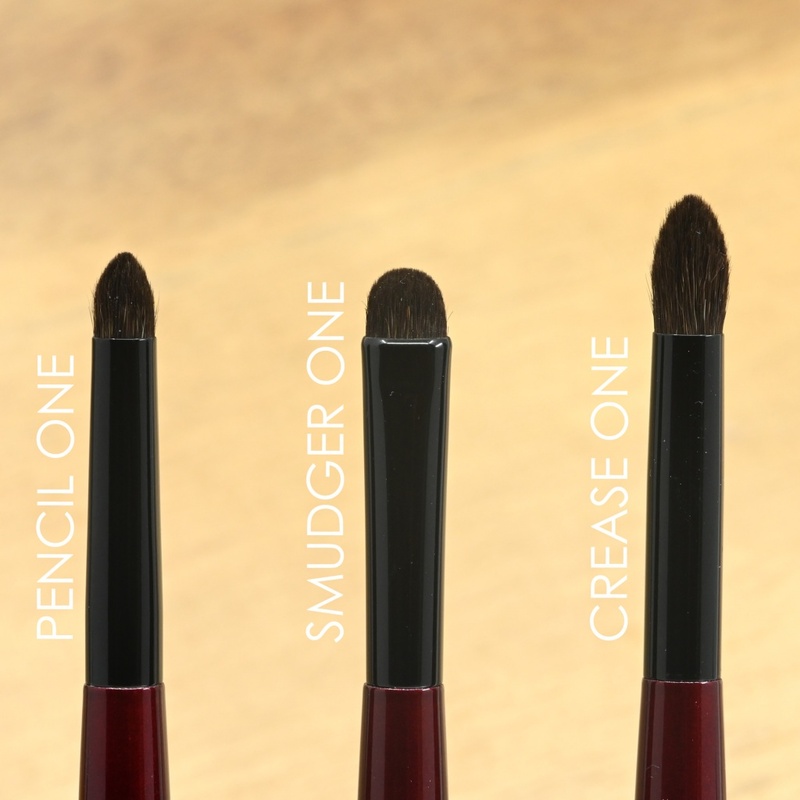 We also just recently added the new Builder Three and the slightly updated Sculpt Two (there is a dedicated post about these two brushes coming soon). The first “break” months (January to February) were more about organizing “Sonia G.” as a company, you have so many administrative tasks to accomplish, not necessarily the most fun part of the adventure but so mandatory. I am just back from a short trip to Japan, I spent a lot of time with the manufactures and also with my contacts in order to work on the future, at this stage I cannot tell you more but it is insanely exciting, I hope things go as planned and that in 6 months I can do another update and tell you much more about it! I strive to get better and better and the more I work with the artisans, the better it gets! Hopefully the passion that we share is translating into these brushes. Many of the missing brushes are in the making, some will be dispatched to Beautylish in March, others in April. By the end of April all the brushes should be back in stock. The Pro Eye Set will be restocked very soon, still in March. The Pro Face Set is likely to arrive only in April but then we probably have enough to sell them individually as well. The other brushes missing from the original collection will come back in stock either in March or April, depending on the brush. Which leads me to the next point: the brushes that “needed to change”, as mentioned in my status of October 2018. Pencil One, Smudger One and Crease One had to be either stopped or switched to alternative versions in a different material, this is mostly due to the price increase of blue squirrel bristles and it’s not going to get any better. So, I decided to somehow keep these brushes in the range but adapt them. The handles remain the same as before. If you know some of my brushes already, you know I am a control freak, I want to know where and how the application is going, my brushes tend to be quite precise with the placement and powerful with the blending. Switching them to goat fits even better my personal desire of evenness and discipline. It has switched from blue squirrel to undyed saikoho goat, same functionality but different brush specs. The shape and ferrule have both changed in order to deliver similar precision capabilities. Both Pencils have similar precision in the placement (although the old One is slightly more precise depending on the pressure you put on the tip). Where they differ a bit is that the new version is more even with the application and offers higher intensity. The previous Pencil One offers a softer type of line, the start of the application is bolder but soon decreasing in intensity. With the new goat version, the application is more even all along and the control with the tip of the brush is increased. So, bottom line: I like the softness of the squirrel bristles, but I personally prefer the stability that a goat brush offers, especially with this new shape. Some would say that a curved ferrule adds more interest to the brush but it is indeed of great use for the purpose in mind: direction, control, smoothness. I added a picture of the Pencil Pro in order to show you that it is rounder and bigger. The shape of the Pencil One is smaller, not quite round but not sharply pointed either which is good when you want an even and super easy placement or smudging. The current squirrel Pencil One is sold out actually so the restock will arrive directly with the undyed saikoho goat version, hopefully in March. The new version has a different material (undyed saikoho goat), a different ferrule and a different shape. The idea with the previous Smudger One was to feel super soft on the skin, but also to be very precise in order to draw a super thin line very close to the lashline, pencil style. Often when you use very directional, thin and firm brushes they feel rough, especially so close to the lashline, I wanted to avoid the roughness and still remain very efficient. I could not do the exact same version in white saikoho because it is already here: it’s the Smudger Two. I wanted something similar to the Smudger Two but softer on the skin, a bit thicker with the application but very steady with either the placement or blending. 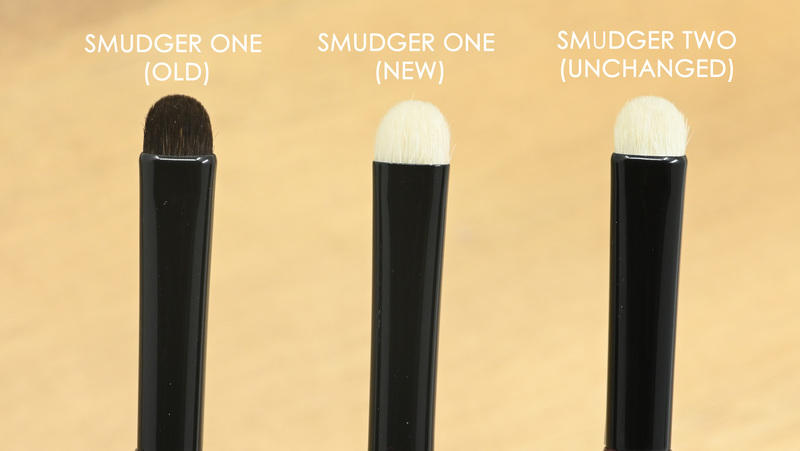 The ferrule of the new Smudger One is not curved, it gives the bristles more thickness sideways and also more movement. 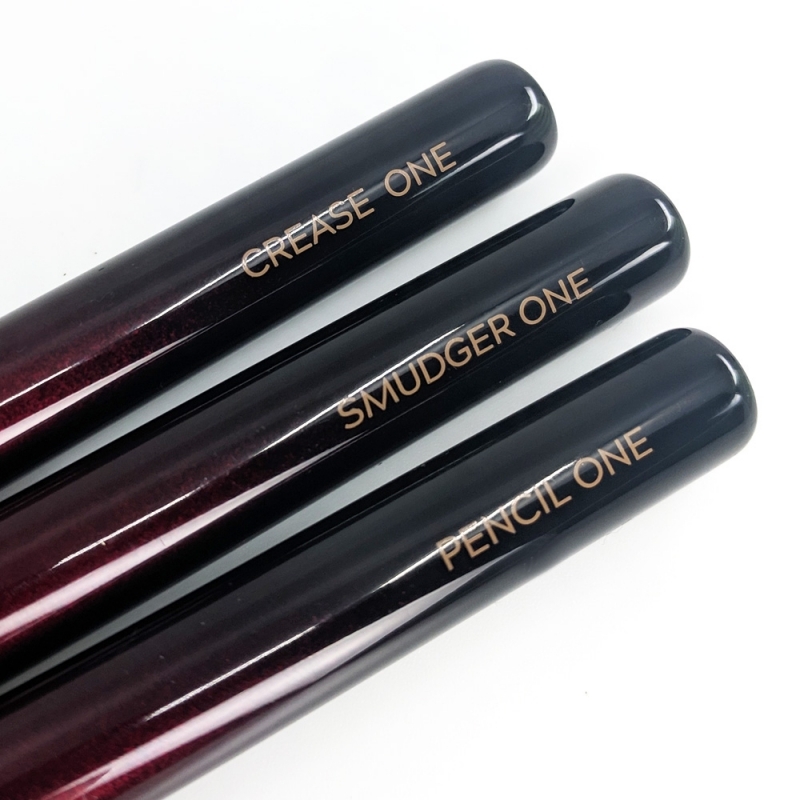 In comparison, the Smudger Two will be very precise so if you need to go and remain close to the lashline the Smudger Two is going to deliver a 2mm (approx) thick line, this is thin (not eyeliner thin but still quite thin). The new Smudger One will deliver a thicker line (approx 3mm) but very even and softer on the skin compared to the current Smudger Two. 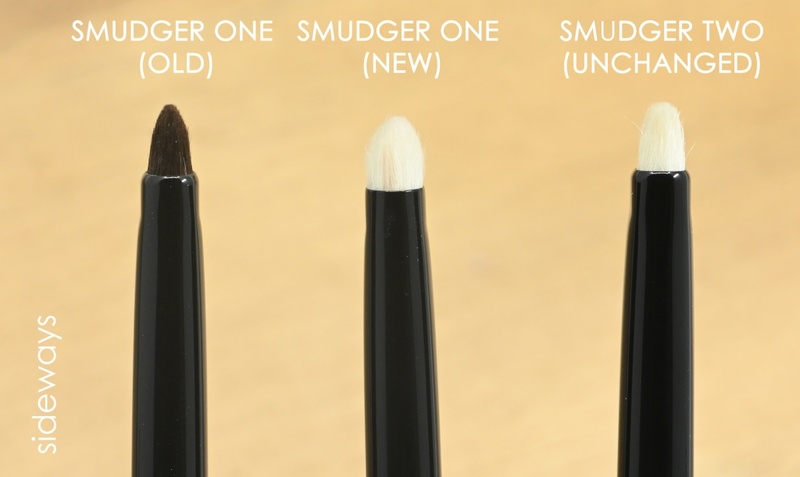 The new Smudger One is not exactly the same size and functionality as the old version but the idea “to softly smudge” does remain. The old Smudger One is already sold out so the new restock coming, probably in March, will already have this new version inside! The new Crease One has the same specs in terms of size but the material is now saikoho goat. The squirrel version was pointier because the body doesn’t fluff out that much so the structure gets to a sharper point. The new saikoho version has more “body” since the bristles are thicker. In terms of placement, you obtain a more even and slightly more intense placement with the new saikoho version. If you have similar brushes in both materials: the squirrel brushes will deliver less intense placement, the building of the color may be a bit more random as the movement is not always that controllable specially when the tip is on the thin side. A goat brush in comparison will move with more discipline so you get better control on the application and the work is achieved much faster. 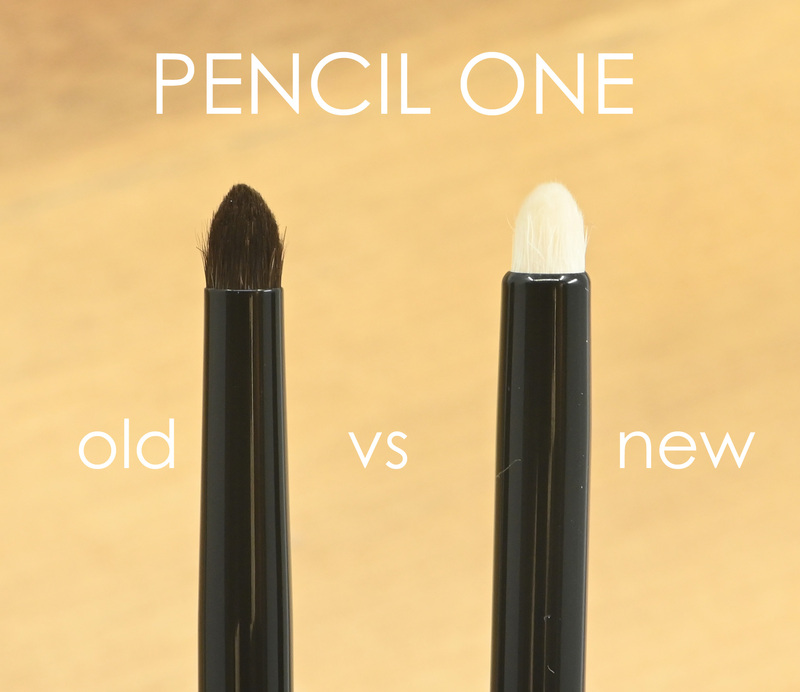 I use this brush a lot to build up the intensity in the crease and then I wing out the shadow application, it is truly effortless to use and definitely a time saver. I know that many prefer squirrel bristles because they tend to be softer on the skin but in general, I definitely prefer the control that goat brushes offer (especially eye brushes) and the softness of saikoho goat is truly exceptional. The old Crease One is sold out, when the restock arrives in March it will come with this new version! The previous versions of these three brushes were absolutely amazing but I have worked very hard to make the replacements as extraordinary as possible and I love them so much! They have all the qualities that I look for in a stunning efficient brush, in fact it’s like driving a small badass sports car, and it’s all about the speed, the control and the thrill! If you have any questions about them, please do not hesitate! I would be so happy to read your comment and answer! Will there be a price difference? I love your brushes! Hi Sonia! 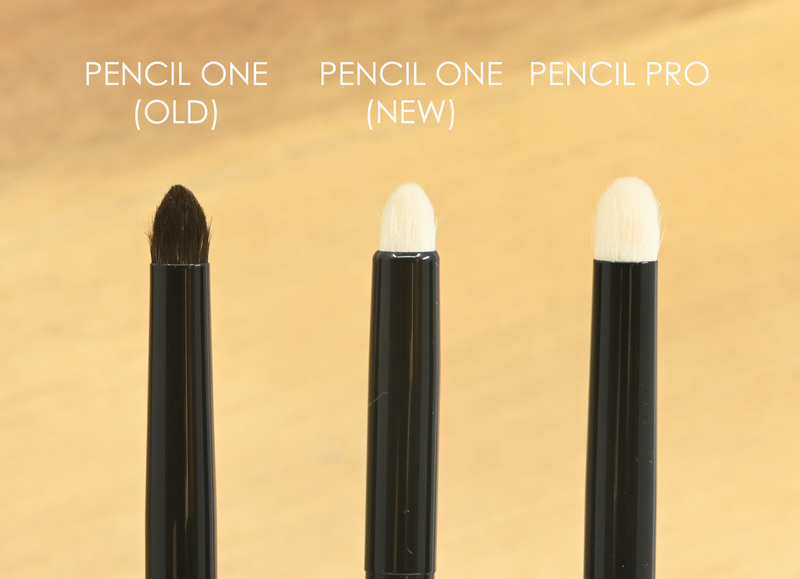 Thank you SO much for the heads up that these brushes would be changing. The Crease One is a staple in my collection. So much so, that I purchased five more to be sure I am covered. I would have been heartbroken if I had missed out on stocking up (it’s happened to me before). I also appreciate that you are explaining why the brushes were discontinued and what to expect with the new versions. You truly go above and beyond for your followers and customers. Again, many thanks and much success to you! Thank you Laurissa! You cracked me up!! 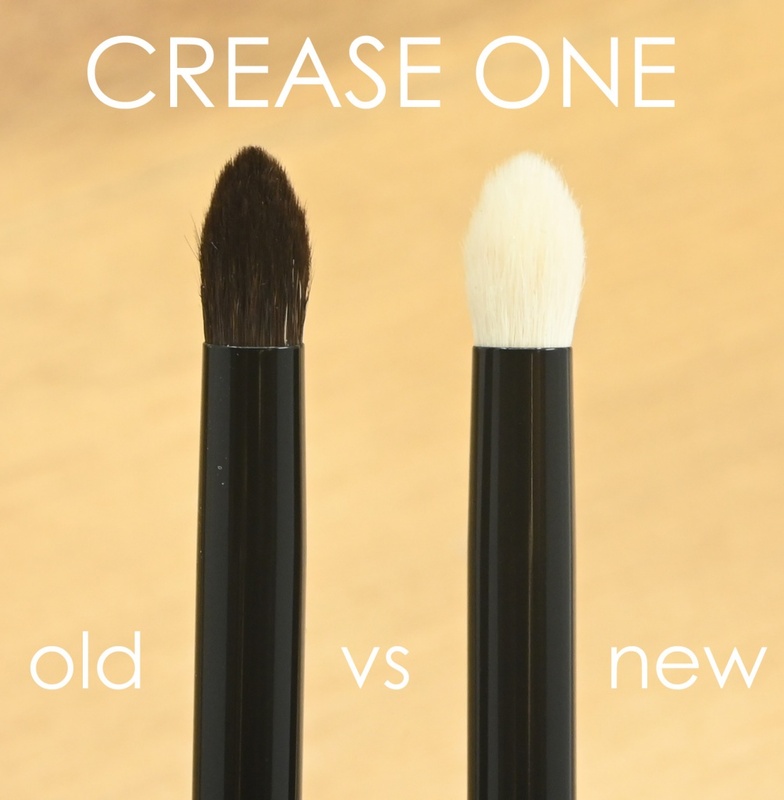 I used to do the same, when I knew a good brush was getting discontinued I usually got a few backups just to be safe 😀 I will continue to share more details about these changes, I feel very connected to my followers and customers, beyond any other aspect of this project, they are the engine and heart of these brushes. Sonia, the goat Smudger One gives a 3mm line. Please, how does this thickness compare to the Pencil Pro, and even with the new goat Pencil One? Thank you so much, Dearheart!!! Stay strong and well. I will send you a swatch of them together and I am going to add and update the brush pages here for each brush so I will post a picture as well!! hugs Denise!! I can’t wait to have these new ones added to my collection! I am so in love with your brushes and each and every time I use them it just makes me smile!! I feel so lucky to have found these brushes, I use nothing else now on my eyes and face. I am so dedicated to your brand, I am actually going to create a Youtube channel to spread the word!! You are a true artist! I am so happy to read your comment, how wonderful to meet passionate people who share this excitement!! I can’t believe you would do that 😀 please let me know if you do!! and thank you so so so much!! !